Amazon recently released the Show Mode Charging Dock for a couple of its current generation Fire HD Tablets. I’ve owned the Amazon Fire HD 10 tablet since it was released. Admittedly, I haven’t used it much. I have a Samsung tablet that I use instead. When I saw the charging dock was available for pre-order, I decided to get one. I figured I’d test out having a big screen Echo show. Worse case, I may find a use for a device that was otherwise collecting dust. Below you will find my pros and cons for the Show Mode Charging Dock, as well as my buyer’s advice. If you have questions or comments about the device, post them in the comments section. I will probably use the tablet more as I probably won’t forget to charge it now. Magnets are used to help you slide the tablet into the correct position for charging. Since the tablet has its own battery, I may use it as an alarm clock now. Hopefully, the alarm works without an internet connection. The dock is expensive. I suspect the $50 device will be $30 shortly. The dock is not required in order to use a compatible tablet as an Echo. A recent software update allows you to use the HD 10 as an Echo without the dock. 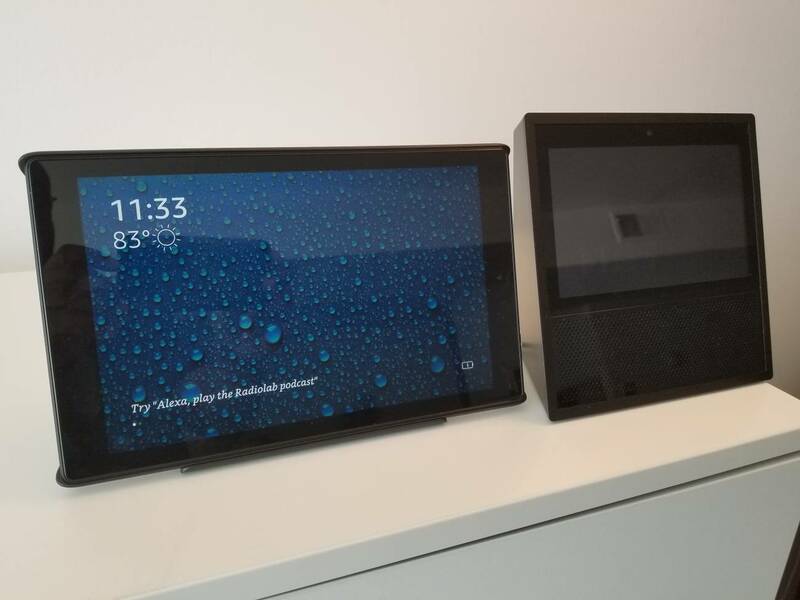 Because the audio from the Fire HD 10 is so tiny, you probably should still consider the Echo Show over the tablet and dock. The charge case included with the dock doesn’t protect the tablet screen. Should you buy the Show Mode Charging Dock? If good audio is a part of your use case, don’t buy the tablet and dock as an alternative to the Echo Show. The audio just good. Perhaps the audio woes can be mitigated with Bluetooth speakers. I may give this a try and update this review. If you plan to use the tablet and dock as a big screen Echo, check the other reviews for all of the current limitations when using a tablet as an Echo. From what I’ve read, the “drop-in” functionality doesn’t work and other Echos on your network cannot see the Fire HD 10. If you already have a compatible Amazon tablet and want to enhance it with a slightly over-priced charging dock, then the dock works well for this use case. After I have played around with it some more, I’ll update this review. Something I haven’t seen discussed yet, but am curious about. Bought an 8″ with the show mode dock. Issue was, I was taking it too many places and went with a more protective case. Bought a 10″ for reading ebooks and as a clock, but haven’t bought a 10″ dock. Since the stand sizes are similar, can I just buy the 10″ “cover” and use it on the 8″ instead of buying the entire stand?